Jews, Muslims, Christians, believers, nonbelievers, residents, tourists, and so many others have ocked for millennia to the cultural richness of Jerusalem. It is one of the world’s greatest crossroads, hosting the variety that is humanity. From her stunning viewpoint, Michal Safdie invites you to see what she sees every day. Perched up on a hill in the Old City of Jerusalem, along the fragile bor- der between the Jewish and Muslim Quarters, is the home of Michal Ronnen Safdie. Facing east, it overlooks the Western Wall precinct, the Dome of the Rock, and the Al-Aqsa Mosque. To the north unfolds the Muslim Quarter with Mount Scopus in the skyline; to the west, the Church of the Holy Sepulcher and the Christian Quarter. Directly under her window is a narrow alley, through which thousands of people pass every day. The alley is a conduit. It is a passage for those entering the Old City through Dung Gate on the south side—mostly Palestinians making their way to their workplaces, schools, markets. It is the route of Christians to the Holy Sepulcher and of Muslim pilgrims during Ramadan, and other holidays, on their way to the Haram al-Sharif (Temple Mount). It is also the path connecting Jews residing in the Jewish Quarter and in the western part of the city, to the Wailing Wall (Western Wall). The view from the window o ers two contrasting perspectives. Across toward the Western Wall precinct: vast ceremonial spaces, and the sil- houette of the Old City quarters. Directly below, in the alley and terraces: a great variety of people seeking the sacred as well as the morning and evening cycles of life’s routines. 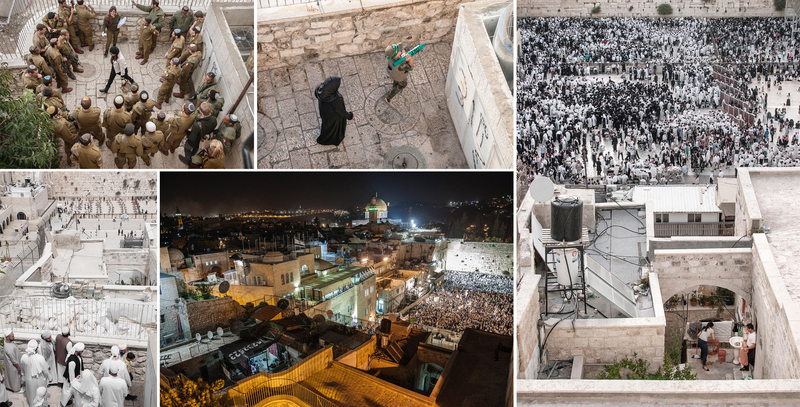 The photographs capture personal moments alongside large-scale public events in the city of Jerusalem, where belief and ritual significantly shape day-to-day life. Born in Jerusalem, Israel, Michal Ronnen Safdie was educated in the fields of sociology and anthropology. Her photographs have been noted for their unusual range, encompassing subjects from the natural world (studies of ice, anthropomorphic trees, and vapor trails) to human crisis and sociopolitical issues (refugees from Darfur, Gacaca trials in Rwanda, the Western Wall, migrant workers' quarters in East Asia, and orthodox women in Israel). Her photographs have been exhibited in galleries and museums around the world. She now divides her time between Jerusalem and Cambridge, Massachusetts. Leading Israeli columnist and writer Ari Shavit is the author of the critically acclaimed New York Times bestseller My Promised Land: the Triumph and Tragedy of Israel. An outspoken columnist for Haaretz, Israel's newspaper of record, and a prominent commentator on Israeli Public Television, Shavit has become one of the strongest voices in the nation's public arena. He challenges the dogmas of both right and left with his unique insights into the roles of Israel and Zionism in the 21st century. Shavit is also a frequent contributor to the New Yorker, The New York Times, the New Republic, and The Sunday Times of London. High-res scans to your specification are available upon request; scanning from the book or lifting images from the mechanical file are strictly prohibited. 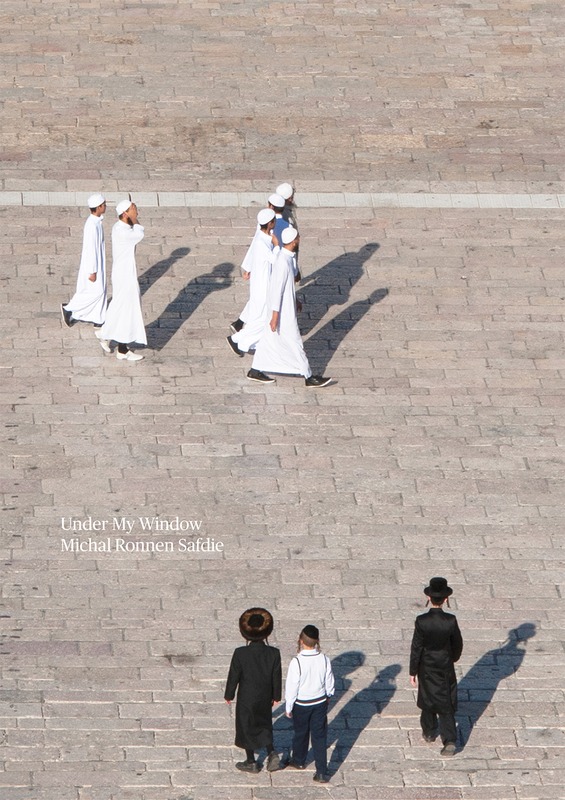 Mandatory credit line: From Under My Window by Michal Ronnen Safdie, published by powerHouse Books.